Malaria is a devastating disease that affects the most vulnerable populations in the globe. It is caused by Plasmodium parasites, of which P. falciparum is the deadliest, and is transmitted by female mosquitoes, when they bite in search of a blood meal. For decades, researchers worldwide have been trying to find an effective vaccine against that which has been called the “scourge of the developing world”. Unfortunately, we are not quite there yet and the most advanced candidate in the pipeline only affords very modest levels of protection. ​​​In the beginning of the century, renewed hopes for malaria vaccination arose from the resurgence of whole-sporozoite malaria vaccines, which had been all but forgotten in the previous decades, despite offering the strongest protective efficacy ever observed in malaria vaccination. In this work, we propose an unconventional approach to the development of a new type of whole-sporozoite malaria vaccine. As the name suggests, whole-sporozoite malaria vaccines employ entire Plasmodium sporozoites, the form of the malaria parasite that resides in the mosquitoes’ salivary glands and is injected in a mammalian host during an infectious bite. In a natural infection, sporozoites infect and multiply inside liver cells, without any associated symptomatology. Pathology ensues once the newly formed hepatic parasites are released into the bloodstream and infect red blood cells, setting off malaria symptoms. Until now, whole-sporozoite malaria vaccination approaches employed human-infective P. falciparum sporozoites administered in an attenuated form. These parasites are fully capable of invading the liver cells, eliciting protective immune responses, while, provided attenuation is complete, they are incapable of infecting red blood cells and causing disease. A few years ago, we had an idea for a different kind of vaccine against malaria. One that could potentially afford the known efficacy of whole-sporozoite vaccination, while ensuring complete safety without the need for parasite attenuation. Our idea draws from Sir Edward Jenner’s pioneering work, when he showed that inoculation of humans with the cowpox virus could afford protection against its related human pathogen, the smallpox virus. Hence was born the first vaccine the world ever knew, and hence was planted the seed of our idea for a malaria vaccine: our proposal is to use a Plasmodium parasite that is not pathogenic to humans and tweak it to serve as a platform for vaccination against human malaria. The parasite is P. berghei, a rodent parasite species that does not cause malaria in humans, and the tweak is to genetically modify it to express antigens of its human-infective counterparts. The result is a non-pathogenic P. berghei parasite dressed in P. falciparum clothes that is expected to elicit a dual layer of immunity elicited by both cross-species and P. falciparum-directed immune responses. 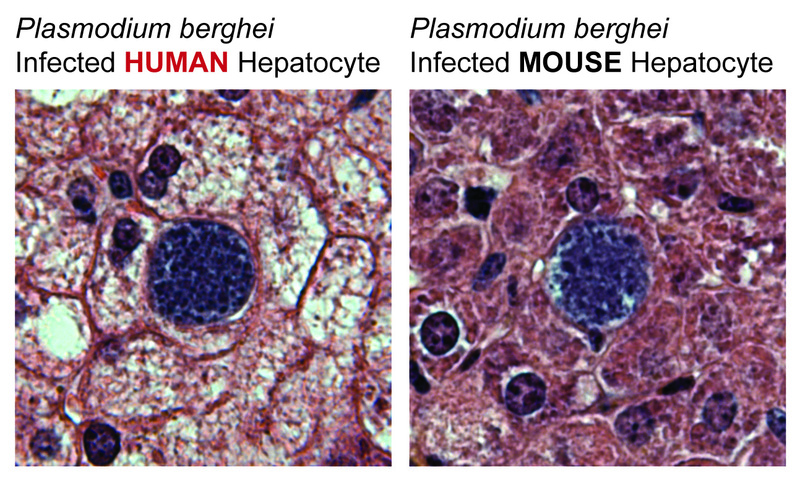 The rodent malaria parasite P. berghei is able to infect human hepatocytes in vivo, in the context of a liver-humanized mouse model. Enter PbVac, a genetically modified P. berghei parasite that expresses on its surface a major P. falciparum immunogen, the circumsporozoite protein. In this work, we show that PbVac meets all the requirements for a malaria vaccine. It infects human hepatocytes, as required for the generation of immunity and is incapable of developing in human erythrocytes, as required for safety. Crucially for our goals, we showed that it displays this exact same behavior in rabbits, allowing us to use this animal as an immunization model. Rabbit immunization experiments employing wild-type P. berghei and PbVac confirmed our initial hypothesis: PbVac elicits a combination of cross-species immune responses (mostly T-cell-dependent) and responses against the engineered P. falciparum circumsporozoite protein (predominantly antibody-based), the latter of which can functionally block liver infection by P. falciparum. The PbVac malaria vaccine candidate: a genetically modified P. berghei parasite that expresses the P. falciparum circumsporozoite protein, a potent immunogen of the deadliest human-infective malaria parasite. Our work establishes an innovative concept of malaria vaccination, and places PbVac, the first member of this new family of malaria vaccine candidates, on the path to clinical evaluation.